Unit sales of digital SLR cameras in the UK are eight times what they were four years ago, despite the economic downturn. Photo Marketing Association (PMA) figures are expected to show that unit sales of DSLRs have soared by 350,000 since 2004. By the end of this year PMA expects the number of DSLRs sold to total around 400,000. Four years ago the figure stood at around 50,000. But there has been a corresponding decline in digital compact sales, says PMA?s UK director Nigel McNaught. He told us that this year will witness ?the first decline in overall value of the digital camera market for many years?. He added: ?It may only be a small decline, perhaps of the order of 1%. But it shows the steady price erosion of average camera values over the years, an erosion which is no longer capable of being offset by the higher value DSLR sales, as has happened in previous years.? Overall annual unit sales of digital cameras in the UK remains fairly constant at around 6.5m units, according to the photo trade body. 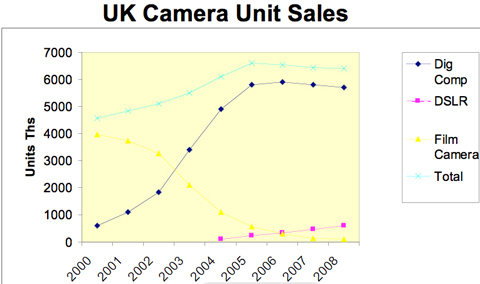 The total value of the UK’s digital camera market stands at around £900m.